Motherland's Gold Moringa Hair & Body Oil is a premium, high-quality oil that is extremely rich in nutrients. It also has amazing antiseptic, anti-inflammatory, and antibacterial properties. It is well known for it's healing, skin-rejuvenating and anti-aging properties. This oil is like "food" for your skin and hair. Massage it into your skin, hair, scalp and even your nails to deliver amazing nutrients that rejuvenatve them. Motherland's Gold Moringa Hair & Body Oil is obtained from the seeds of the Moringa Oleifera plant. The seeds are cold pressed, which extracts the oil from the seeds while keeping the nutrients intact. Motherland's Gold Moringa Hair & Body oil is not heated or refined, preserving its full nutritional value. Moringa oil has been used by Africans as far back as ancient Egypt (North Africa). This expensive oil was very valuable in ancient times. In addition to other uses, it was anointed on the skin of bodies during mummification. Moringa oil was found in the Valley of the Kings, in the tomb of Maiherpri from the 18th Dynasty (1549-1292 BC). Maiherpri had rich, Black skin. When his mummy was unwrapped in 1901 (approximately 3,400 years later), is was noted that his Black skin was unchanged by time. Want the best? Try Motherland's Gold Moringa Hair & Body Oil. It comes in a glass bottle for ultimate in safety and quality. The Motherland's Gold Moringa Hair & Body Oil is Amazing! This All Natural Moringa Oil is a Healthy way to keep my hair and skin looking Great! I've never really been a lotion person, so oil-based products (free of the extra ingredients/chemicals) are ideal for my bodily care. Since being introduced to this product I can cover two bases at once! My skin is smooth and my hair is healthier than ever before. I can't tell you how often I get compliments on and inquiries about what I use to keep my beard moisturized and vibrant.. It's a secret used by our ancestors, Moringa! Motherland's Gold Moringa to be exact! When my hands get dry, the skin right above my nails cracks and begins to peal. I try to pull it in the right direction (towards the nail) so it doesn't look bad and jagged. That doesn't always work out. It always ends up looking rough. I started using the Motherland's Gold Moringa Hair and Body Oil on my fingertips each morning and the skin above my nails began to heal. I did it on one hand to test it out and it worked wonderfully. I can tell when I don't use it for a couple of days and that skin begins to crack and peal. The Motherland's Gold Moringa Hair and Body Oil is amazing!!! I love Motherland's Gold Moringa Hair & Body Oil because it is light and absorbs quickly. Also, it leaves no oily residue. I applied it to a small area on my body that had an irritating rash before going to bed and the next morning it was not itchy or noticeable any more. Not only will I use it for my skin and hair, but I will keep it for first aid purposes as well. 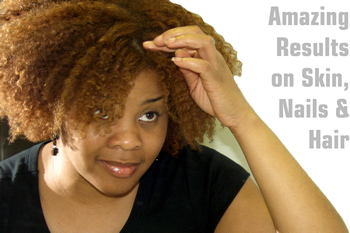 I used Motherland’s Gold Moringa Hair & Body Oil on my natural hair, after washing. Wow! The oil instantly added softness and volume to my hair. What a great product! Motherland's Gold Moringa Hair & Body Oil is the best oil for several reasons! 1. I suffer witn a dry skin from my head to my hands. I used this oil and bam! 2.The oil not only moisturized my skin, but it also tremendously reduced my dry scalp and itching! This oil is amazing! Thank you Motherlands Gold!